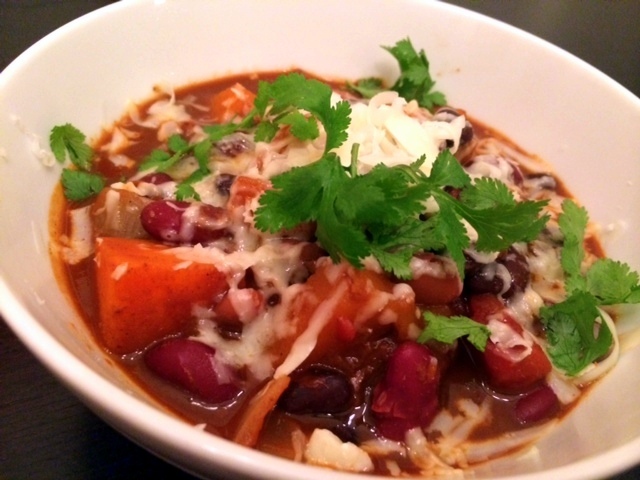 This vegan chili gets its deep, rich flavor from chipotle peppers and cocoa. Using a combination of black, pinto and kidney beans plus butternut squash, this hearty stew is both satisfying and healthy. Heat olive oil in a dutch oven or heavy bottom pot over medium heat. Add onions and saute until translucent about 8 minutes. Add garlic and saute until fragrant about 1 minute more. Add next 10 ingredients (squash through chipotle peppers) and bring to a boil. Reduce heat to simmer and cover, cooking 30 – 40 minutes until squash is cooked through and tender. Taste and adjust seasoning with salt and pepper. To serve, ladle into bowls, garnish with cilantro and shredded cheese and drizzle with extra virgin olive oil. *We used We Olive Mission Olive Oil for this recipe, but feel free to substitute your favorite EVOO here. We also think We Olive Fresh Garlic ,We Olive Jalapeno (or other chili pepper infused olive oil) or Sonoma Smoked Olive Oil would work well here. **The Smoked Olive’s Smoked Brown Sugar is available in many We Olive locations. Contact store to confirm availability. If you can’t find Smoked Brown Sugar, substitute an equal amount of brown sugar. Swapping out the regular chili powder with chipotle chili powder will add a smoky element.